Fragrances seem to be the beauty product most en vogue recently. First came Glossier's debut fragrance, which was formulated to smell like your significant other's favorite T-shirt. Next came Kim Kardashian West's three crystal-inspired gardenia perfumes. Then, we heard about a luxury perfume brand that released high-end fragrance made with narcotics like opium and absinthe. Now, even haircare brands are experimenting and designing scent, or at least one of our favorite brands is. 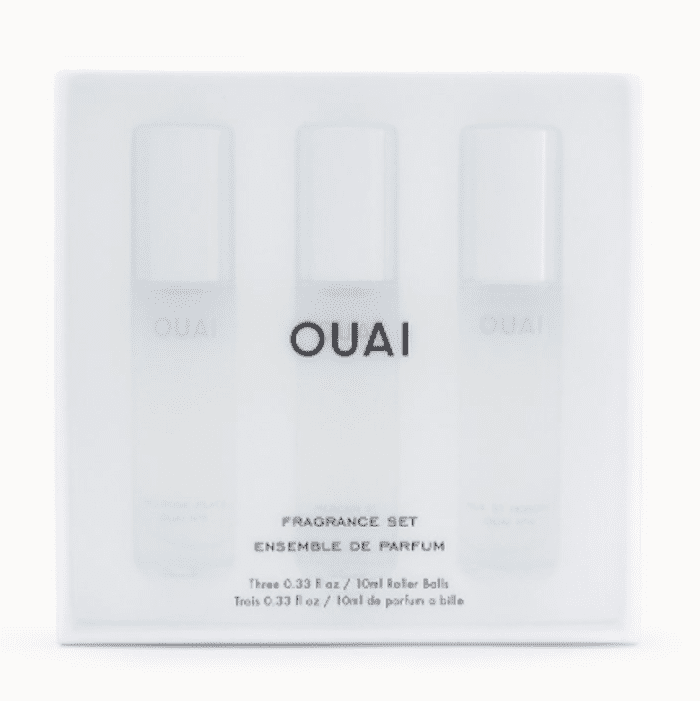 Today, Ouai, the haircare brand founded by celebrity hairstylist Jen Atkin (who styles the strands of celebs like KKW, Bella Hadid, and Chrissy Teigen), announced the launch of three new limited-edition fragrances. Though the thought of a hair brand creating fragrances sounds kind of random at first, it's anything but. All of Ouai's products have light, fresh, and unique scents, whether that's the Rose Hair and Body Oil ($32) or The Wave Spray ($26). The brand has channeled these scents that they've already cultivated into a set of three fragrances. The three scents are inspired by Atkin's favorite places—Los Angeles, Paris, and London. There's Melrose Place (or Ouai No. 5), Rue St. Honore (or Ouai No. 4), and Mercer St. (or Ouai No. 1). They're all floral and musky fragrances though different in unique ingredient combinations. Melrose Place is a "warm rose fragrance" with bergamot, lychee, and white musk. Rue St. Honore is very floral-based, with a composition of violet, gardenia, ylang-ylang, and white musk. Finally, Mercer St. is "sheer and airy," with notes of Italian lemon, Turkish rose, lily, and iris flowers. All three fragrances are available for a limited time in a set of three rollerball applicators. The box set can be purchased now on Ouai website just in time for holiday shopping. Next, see holiday beauty gift sets that take the stress out of shopping.